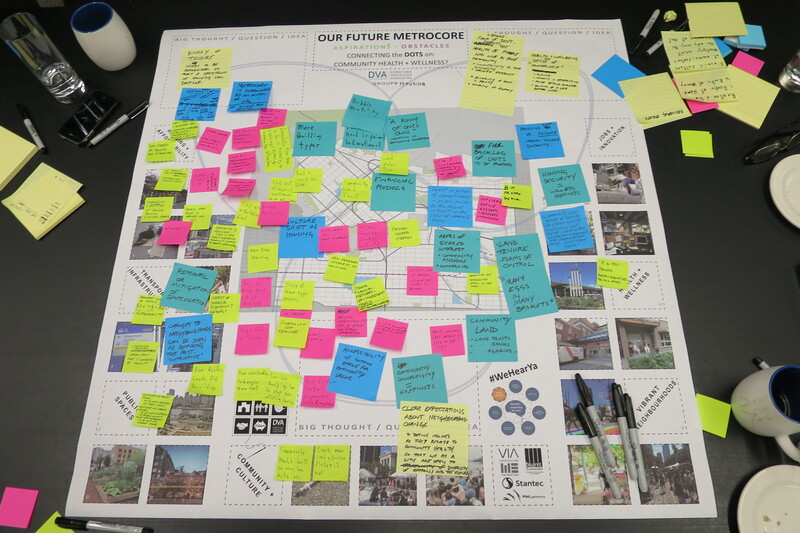 On December 8, 2015, the DVA held its fifth in a series of Metrocore Quilting roundtables exploring the connection between this year’s subject area Health and Wellbeing and some of the key components of successful city-making. The goal is to generate a “quilt” of insights leading to inform the development of a DVA advocacy strategy on the subject of Health and Wellbeing. …a housing and affordability perspective. The December 8 roundtable hosted by VIA Architecture brought together participants involved in the realm of housing and affordability to explore the shared understanding between residents, businesses, and community organizations that can help us inform our position on health and wellbeing in Vancouver’s Metrocore. Clear expectations about neighbourhood change to define values as they relate to community health so that we as a city are open to a diversity of options in the future. Connectivity to those in a community. Security of home and equity. Binary of tenure needs to be recognized so that a spectrum of housing can develop.